Last week, three women were arrested after they attempted to steal a couple Rolexes from two unsuspecting tourists in Las Vegas, stashing the valuable evidence in their trusty vaginas. Good grief. After some time, police state one of the women undressed one of the men and performed a sexual act on him in a separate part of the room. 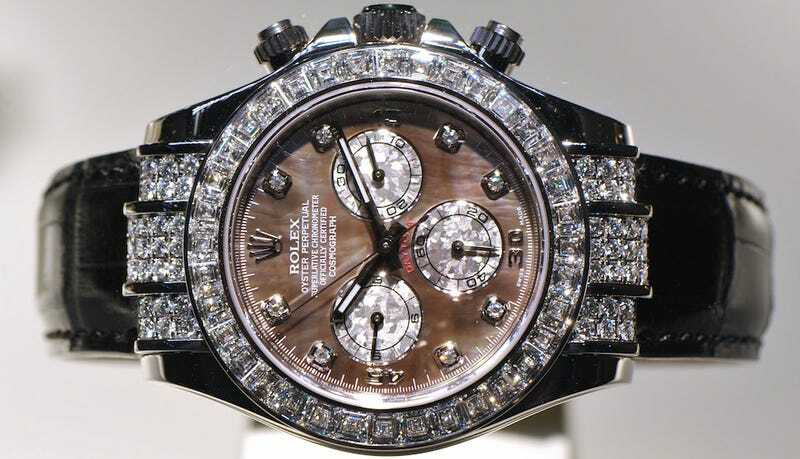 During the act, police said the man removed his $12,000 Rolex watch. Another woman also begins to get physical with the other guest at the same time, prompting him to remove his $4,000 Rolex watch, the report states. Police said the tone in the room suddenly changed when one of the men noticed his watch disappearing from where he left it. The women were seen fleeing the room, running towards an elevator with one of the men following. Then one of the ladies pulled a stun gun on the man who pursued them and were able to get away. In the elevator, the women stashed the rolexes in their handy dandy…vaginas, which could have potentially been a smart idea if the whole ordeal wasn't caught on video. Sigh. The women were promptly arrested (in the taxi pick-up area of the hotel—it's like they didn't even try) and police recovered one of the watches and the stun gun. It wasn't until after her booking and a strip search that one of the women produced the watch herself. In conclusion: LADIES, I BESEECH YOU. USE YOUR NATURAL POCKETS FOR GOOD!